Canada geese are the centerpiece of this year’s federal “duck stamp,” which went on sale Friday to raise millions of dollars to conserve wildlife habitat. 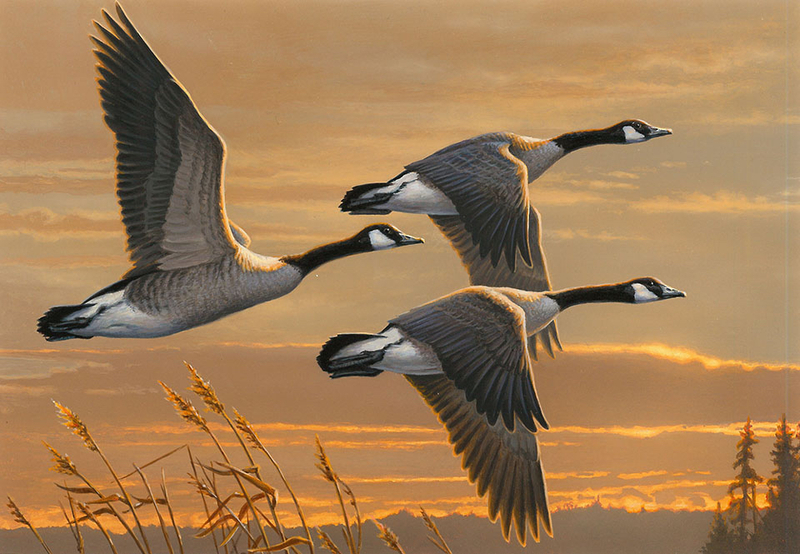 James Hautman of Chaska, Minn., won first place in the annual duck stamp contest with his acrylic painting of Canada geese. 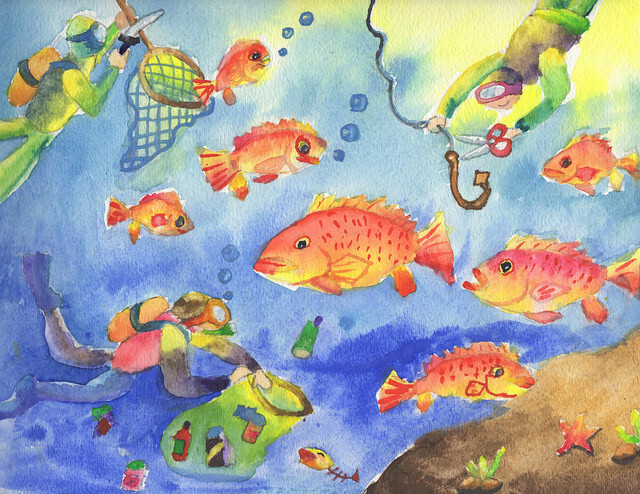 James Hautman of Chaska, Minn., painted the artwork that became this year’s stamp following a contest last fall that attracted 152 entries. The stamp shows three Canada geese flying in formation over a wheat field. 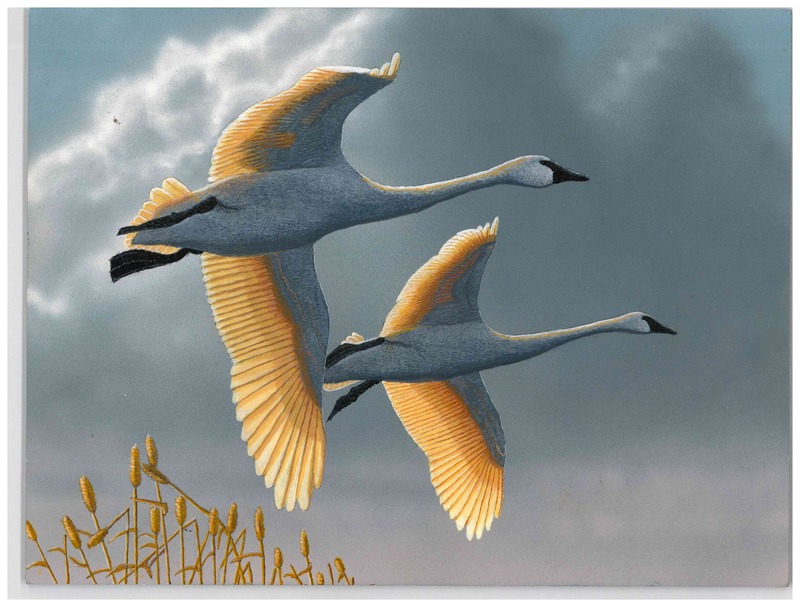 This year’s winning entry is Hautman’s fifth win in the duck stamp competition. Only two other artists have won first place five times — and one of those is Hautman’s brother Joseph. 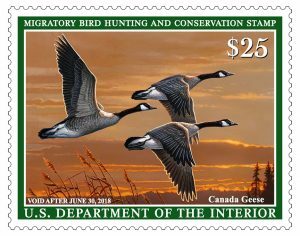 Since 1934, sales of the stamp — formally called the Federal Migratory Bird Hunting and Conservation Stamp — have reached $950 million, according to the U.S. Fish and Wildlife Service, which is in charge of the stamp. The money has been used to conserve nearly 6 million acres of wetland habitat as part of the national wildlife refuge system around the country. Some 98 percent of the funds from sales of the $25 duck stamp go into the Migratory Bird Conservation fund. If you have time, check out all of the duck stamps starting with some interesting ones you will find in the 1930s and ’40s in the Federal Duck Stamp Gallery. 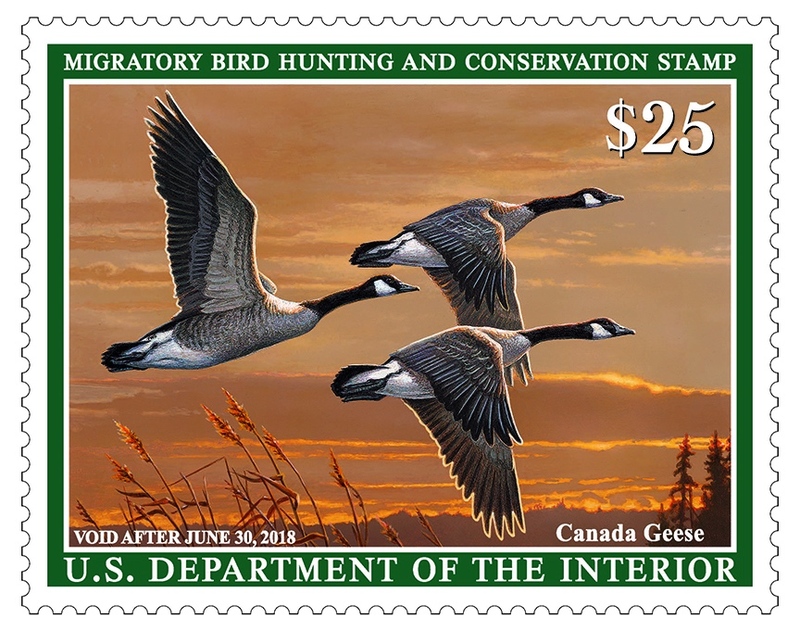 The stamp is legally required for waterfowl hunters age 16 and older, but the program has grown over the years thanks to stamp collectors and supporters of wildlife conservation. The current duck stamp also provides free admission to any national wildlife refuge. 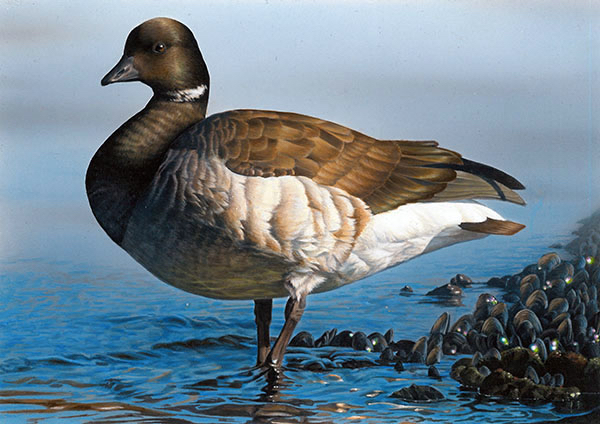 Rebecca Knight of Appleton City, Mo., took second place with her acrylic painting of a brant. 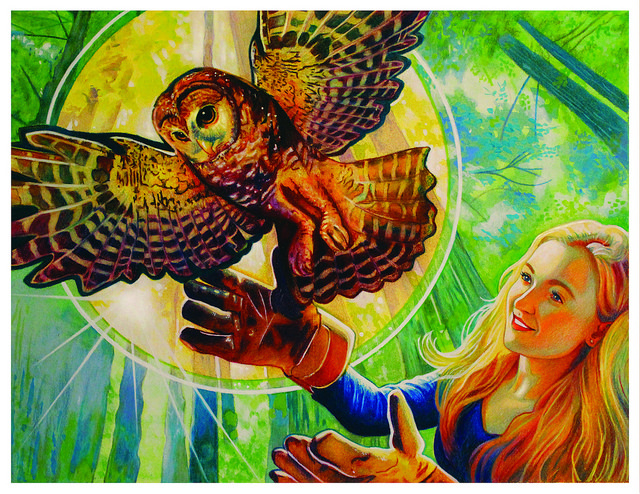 The duck painting that took second place in last fall’s contest was the creation of Rebekah Knight of Appleton City, Mo., who previously won the National Junior Duck Stamp Contest. 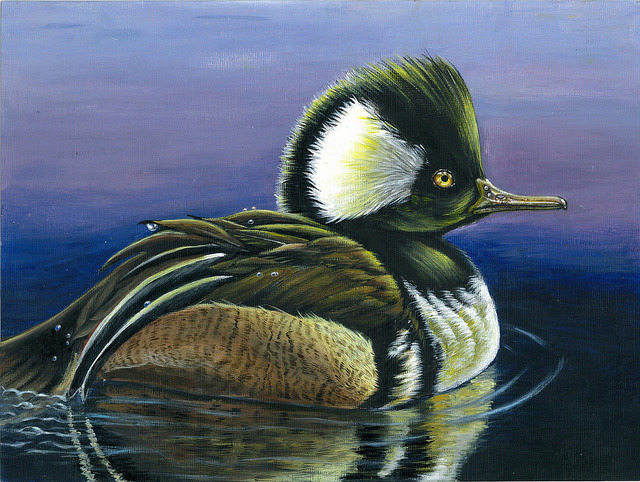 Her entry last year was an acrylic painting of a single brant. 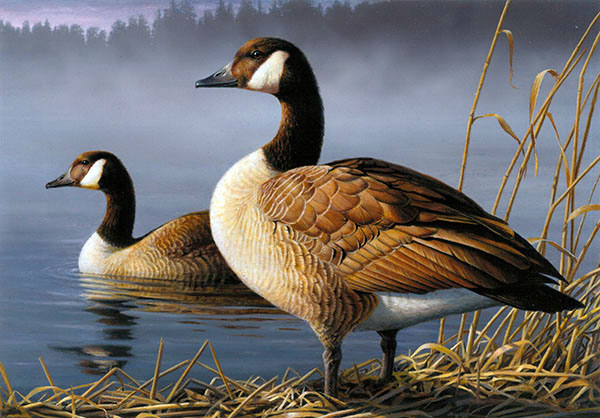 The third-place winner was Robert Hautman of Delano, Minn., with his acrylic painting of a pair of Canada geese. Hautman, brother of James and Joseph, previously won the contest in 1996 and 2000. Robert Hautman of Delano, Minn., was the third-place winner with his acrylic painting of Canada geese. Judges for this year’s duck stamp were Jan Martin McGuire, an internationally known wildlife artist; Keith Russell, program manager for urban conservation with Audubon Pennsylvania; Dr. Nathan H. Rice, ornithology collection manager at the Academy of Natural Sciences; John P. Booth, executive director of the Ned Smith Center for Nature and Art; and Sue deLearie Adair, an artist, birder and avid naturalist. A gallery of all the contest entries can be viewed on the U.S. Fish and Wildlife Service Flickr page. 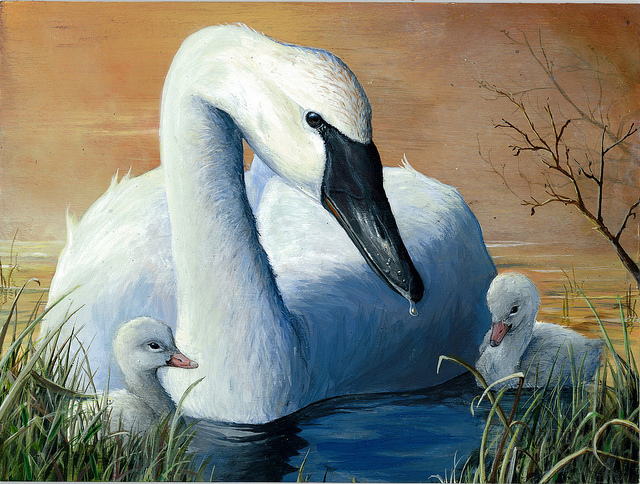 Isaac Schreiber 12, of Duffield, Va, was named the winner of the Junior Duck Stamp competition with his acrylic painting of trumpeter swans. A Junior Duck Stamp is chosen each year from entries made by students from across the United States and Puerto Rico. This year’s winner is Isaac Schreiber, 12, of Duffield, Va., who painted a pair of trumpeter swans. Second place went to Daniel Billings, 16, of Gallatin, Mont., for his oil painting of a wood duck. Rene Christensen, 17, of Nekoosa, Wis., took third place with her graphite rendition of a pair of Canada geese. The junior contest is part of an educational program about wetlands, waterfowl and conservation efforts. 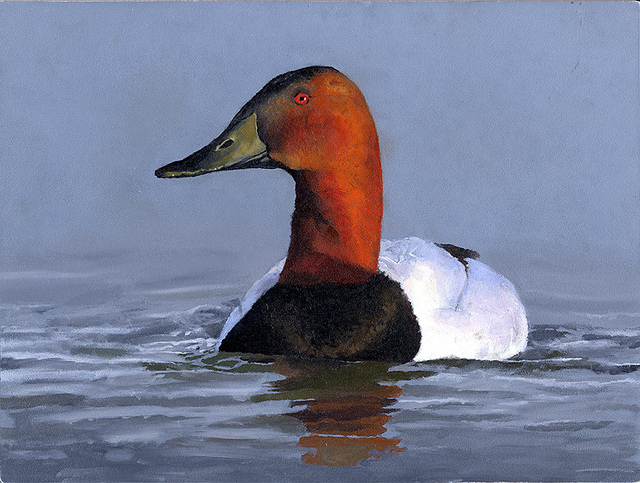 Proceeds from sales of the $5 Junior Duck Stamps are used to support youth education. A gallery of the “best of show” winners can be seen on the U.S. Fish and Wildlife Service Flickr page. Both the regular and junior stamps can be purchased at many national wildlife refuges, sporting goods stores and related retailers and through the U.S. Postal Service. For information, check out the “Buy Duck Stamps” website. In celebration of national Endangered Species Day on May 20, students from across the country were invited to create artwork about species that could be headed for extinction. Although the number of entries was somewhat limited, I have been much impressed with more than a few of these pieces. 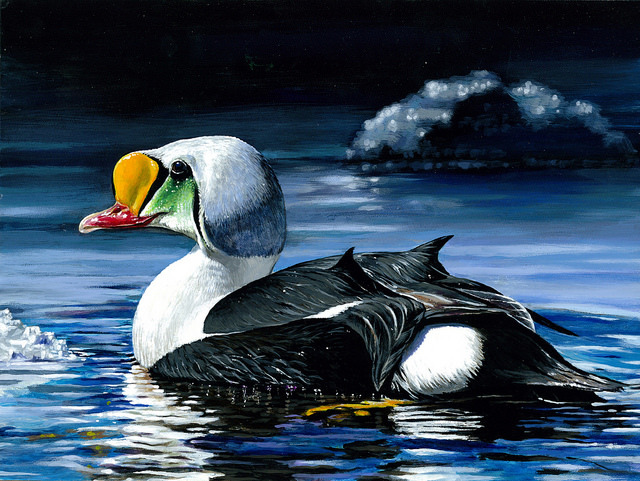 The Saving Endangered Species Youth Art Contest is sponsored by the U.S. Fish and Wildlife Service, Endangered Species Coalition, Association of Zoos and Aquariums, and International Child Art Foundation. 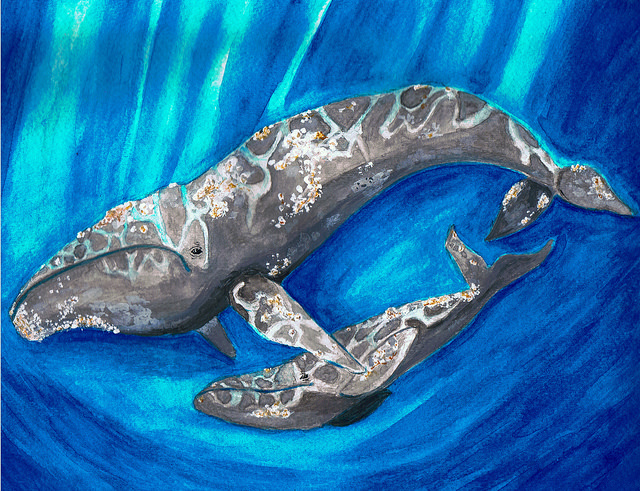 The contest was established to encourage students to learn about threatened and endangered species and to express their understanding and feelings through art. Judges included Wyland, the well known marine life artist; Jack Hanna, host of television shows featuring wild animals; David Littschwager, a freelance photographer and contributor to National Geographic magazine; Susan Middleton, a photographer and author who has produced several books of nature photography; and Alice Tangerini, botanical illustrator for the Smithsonian Institution. Entries were submitted in February and March. 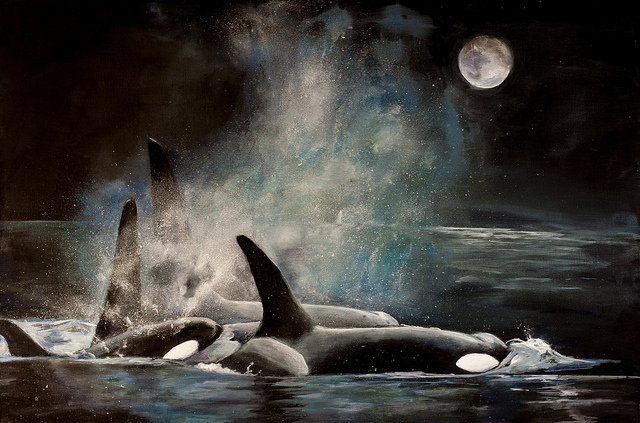 The painting of Southern Resident Killer Whales was created by 17-year-old Christopher Chen of Oak Grove, Calif. The artwork was named a semifinalist in the endangered species art contest. 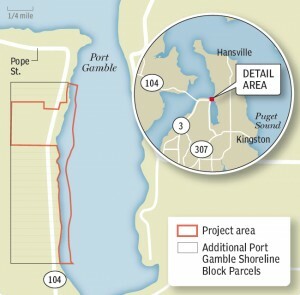 Of course, those of us who live in the Puget Sound area are at least somewhat familiar with the three pods of Southern Resident orcas, a population listed as endangered under the Endangered Species Act. 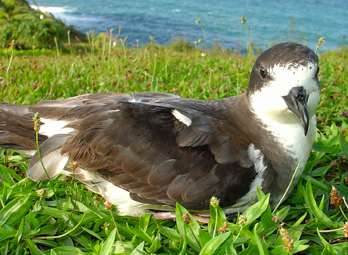 See NOAA’s Species in the Spotlight. The picture of Atlantic salmon, third on this page, by Katrina Sharonin, 12, took first place among the sixth through eight graders. 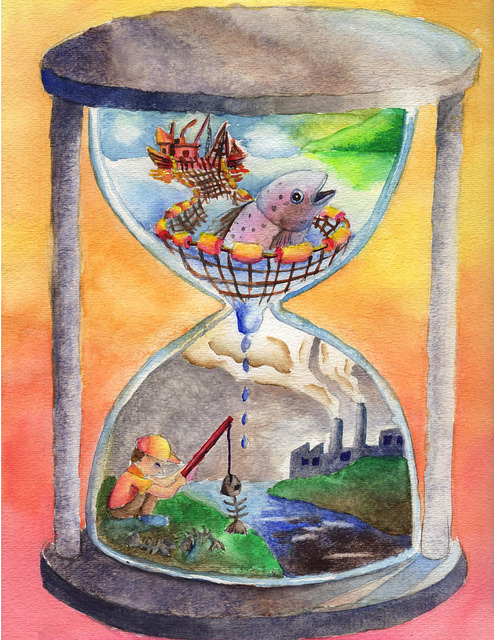 I thought the hourglass was an important element, something to show that the species may be running out of time. Although we think of Atlantic salmon as farmed fish on the West Coast, remnant populations of wild Atlantic salmon can still be found in central and eastern Maine. Once abundant along the East Coast, Atlantic salmon are now one of the most endangered species in the U.S. See NOAA’s Species in the Spotlight. By the way, Katrina is another student from Belmont, Calif., which had a large number of excellent entries. Elizabeth Kiernicki, 17, of Pingree Grove, Ill., was the first-place winner among the students in grades 9 through 12 with her picture of the northern spotted owl. The spotted owl, listed as threatened, was once found in forests from Southwest British Columbia through Western Washington and Western Oregon and as far south as San Francisco Bay. Now, remnant populations are in decline in scattered areas, primarily remaining segments of old-growth forests, while a significant population survives on the Olympic Peninsula. See U.S. Fish and Wildlife Service webpage. 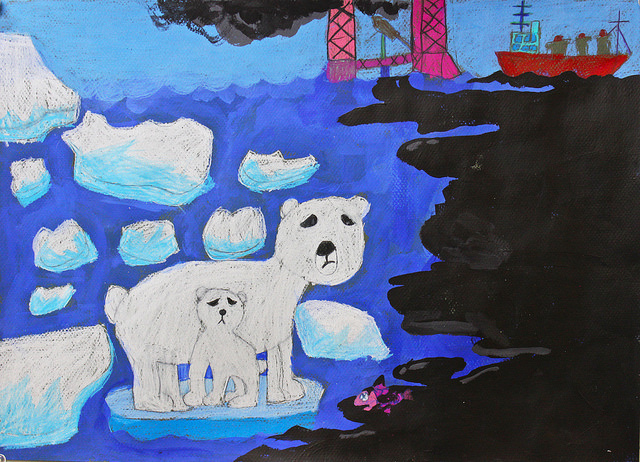 Other semifinalists include Matthew Lei, 11, of Portland, Ore., with his portrait of a mother gray whale and her calf, and Michelle Chang, 7, of Centrevile, Va., with her picture of a mother polar bear and her cub waiting on a chunk for broken ice. To see all the semifinalists, visit the Flikr page showing semifinalists or you can scan through all the entries by going to the Flikr page organized by grade level. Endangered Species Day will be celebrated with events organized by groups around the country. You can find registered events on the webpage “Celebrate Endangered Species Day,” although you may need to do an Internet search for details. It’s not hard to find information about the Endangered Species Act or individual species with an Internet search engine, but the U.S. Fish and Wildlife Service gives you a place to start with its Endangered Species Day website. Endangered Species Day was designated by U.S. Senate resolution in 2006 to encourage teachers across the country to spend at least 30 minutes “informing students about threats to, and the restoration of, endangered species around the world” and to encourage organizations and business to help produce educational materials. As far as I can tell, a 2012 Senate resolution was the last time that Congress officially recognized Endangered Species Day, although it has continued with the support of the U.S. Fish and Wildlife Service. Since tomorrow is Veterans Day, entrance fees are being waived at most national parks, national forests, national monuments, national wildlife refuges and other federal lands in Washington state. For details, visit the website of the agency in charge. It’s the water, or maybe it’s just the nasty stuff that’s in the water. A new series of studies by federal researchers is delving into the question of which pollutants in urban streams are killing coho salmon. 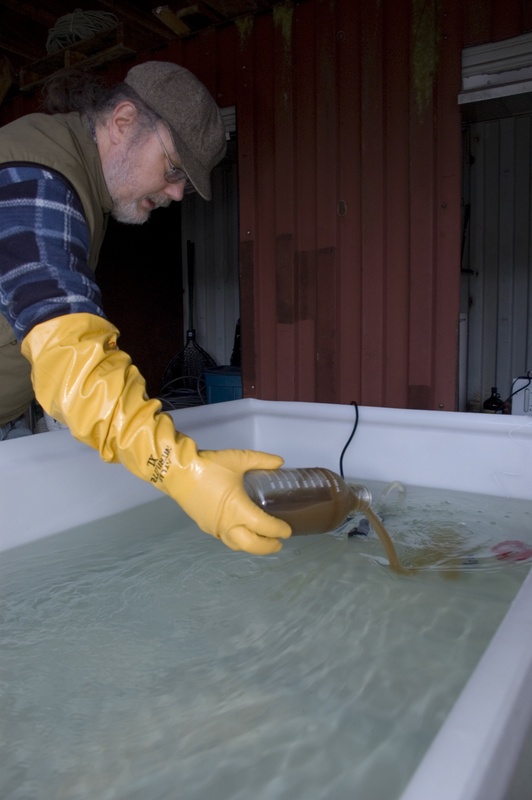 David Baldwin of Northwest Fisheries Science Center mixes a chemical soup of pollutants found in urban stormwater. Coho salmon will be kept in the brown bath for 24 hours to measure the effects. As I describe in a story in today’s Kitsap Sun, the new studies involve coho returning to the Suquamish Tribe’s Grovers Creek Hatchery in North Kitsap. Of course, pollutants in streams are just one factor affecting salmon in the Puget Sound region, where development continues to alter streamflows and reduce vegetation, despite efforts to protect and restore habitat. But pollution may play a role that has gone largely unnoticed in some streams. The new studies continue an investigation that began more than a decade ago with the involvement of numerous agencies. 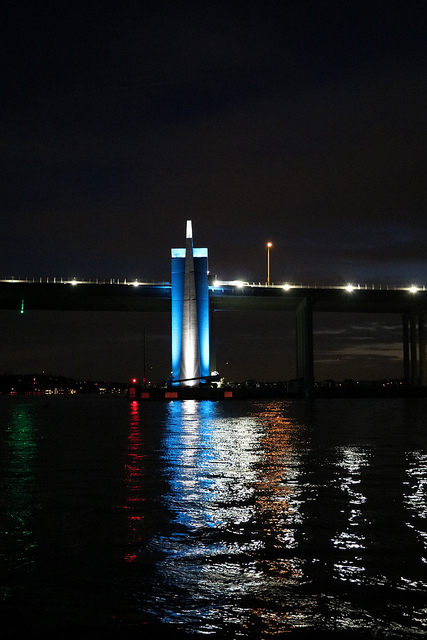 By now, most of us have heard about the effects of copper on salmon, but the latest round of studies will look at the collection of pollutants found in stormwater to see how they work together. It may be possible to pinpoint the chemical concentrations that result in critical physiological changes in salmon. The latest work involves a team led by David Baldwin of NOAA Fisheries and Steve Damm of the U.S. Fish and Wildlife Service. The Suquamish Tribe is providing the fish, along with facilities and support. A page called “Coho Pre-spawn Mortality in Urban Streams” presents a series of videos that show the advance of an apparent neurological disease that first causes disorientation in coho salmon and then death. The video is taken in Seattle’s Longfellow Creek, an urban stream. Since I first posted this item, Scott Veirs pointed out that the recovery of Atlantic salmon is under the joint jurisdiction of the National Marine Fisheries Service and the U.S. Fish and Wildlife Service. I was not aware of this, and it could help explain the president’s statement. Thanks, Scott. See below for Scott’s comment and my response. 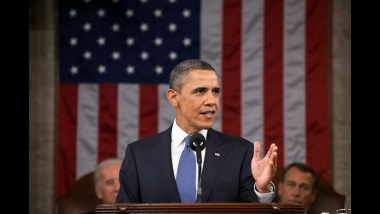 President Obama made a joke about salmon in his “State of the Union” speech last night, but his statement didn’t ring true to me, so I did some checking. The truth is the National Marine Fisheries Service is in charge of most salmon listed under the Endangered Species Act, no matter where they are. NMFS, of course, is an agency under the National Oceanic and Atmospheric Administration, which is under the Department of Commerce. Poulsbo Elementary first-grader Ella Jagodzinske, 7, looks for worms under a rock in the school's courtyard wildlife habitat. Now in Washington state, requirements approved by the state Superintendent of Public Instruction are designed to take another huge step in preparing young people to understand all sorts of environmental tradeoffs and write environmental policies for the coming decades. The word “sustainability” is emphasized in the new “Integrated Environmental and Sustainability Education Learning Standards.” Unlike other educational standards, this new approach does not include specific grade-level expectations. The standards call for an understanding of: 1) Ecological, social and economic systems, 2) the natural and built environment, and 3) sustainability and civic responsibility. 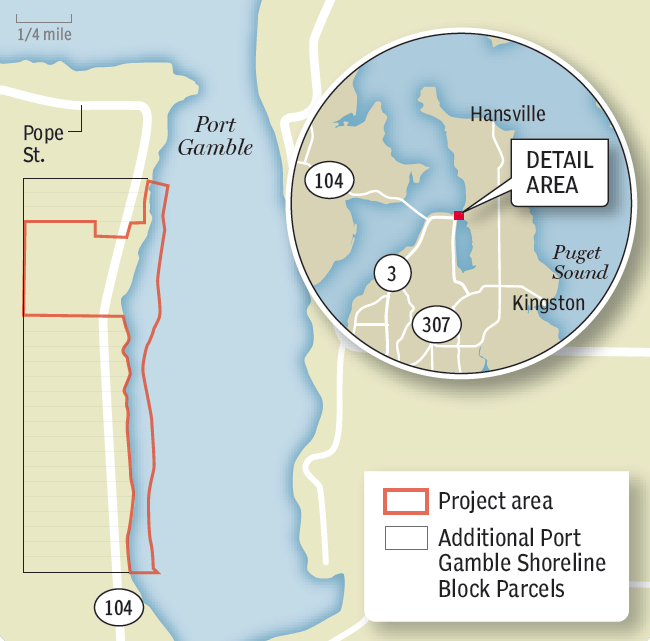 I hope you’ll read the Sunday piece, which includes an interactive map of environmental programs and projects across the Kitsap Peninsula. You’ll meet Lisa Hawkins, a first-grade teacher who built an outdoor classroom — a certified wildlife habitat — in a courtyard at Poulsbo Elementary School. This amazing young teacher has a special relationship with her students, especially when they are exploring freely and finding connections among living things. Here are some links for creating habitats to foster environmental learning at all grade levels. 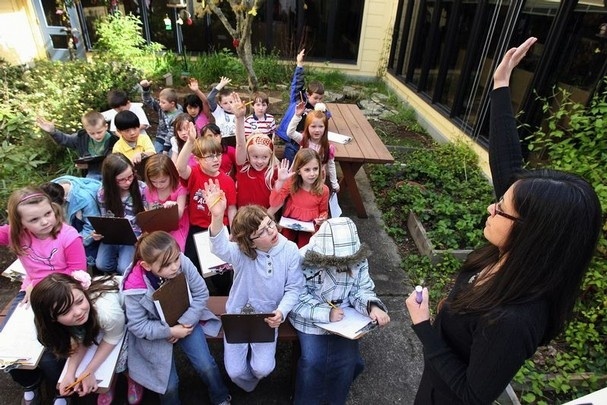 Lisa Hawkins, first-grade teacher at Poulsbo Elementary, engages her students in the wildlife habitat she and an earlier class created in a courtyard at the school.